The Clinton campaign has been trying to blame many of their problems on Russia, imagining a conspiracy between Trump and Putin and engaging in what has felt like Cold War era red-baiting. Whether Putin genuinely believed that Clinton was plotting his overthrow is another question. But he has repeatedly criticized the U.S. for “regime change” policies that have toppled authoritarians in other countries, including Iraq and Libya, that Clinton supported. In the latter case, Putin was furious when a 2011 U.S. and European military operation billed as humanitarian — and advocated by Clinton — evolved into a de facto campaign against dictator Muammar Qadhafi. It has been a goal of Clinton’s fellow neoconservatives to also achieve regime change in Russia, similar to Iraq and Libya, and Clinton has threatened war with Russia. 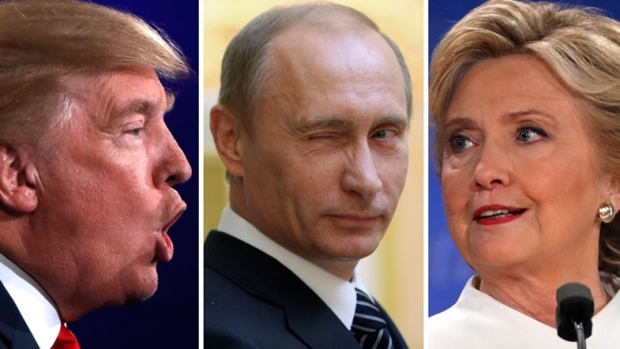 Even prior to this threat, Putin and other Russian leaders have believed that the election of Clinton would mean war between the United States and Russia, giving them motivation to oppose Clinton without any plots between Trump and Putin. Another story in The New York Times describes how Donald Trump Used Legally Dubious Method to Avoid Paying Taxes. Update: Slate reviewed some of the suspicious behavior which has suggested communications between the Trump Organization and Russia.